Twin 25 mm mountings intended for Romania. Image courtesy of John Schaefer. Hotchkiss worked on automatic 25 mm designs during the 1930s but could not sell them to the French Army or Navy. They did succeed in the export market with some single and twin mountings being sold to Romania and possibly also to the Soviet Union prior to the war. In addition, the Japanese obtained a manufacturing license from Hotchkiss in 1935 and developed their own 13 mm and 25 mm automatic weapons based upon Hotchkiss technology. It is not clear if any of the Romanian guns were actually delivered and what guns had already been produced were taken over by the French at the start of the war. Following the Armistice, the Romanians did get at least some guns in 1943. The French Army used the requisitioned and new production guns in their CAMle 1938 which was a single-gun, towed tripod ground mount that entered service in 1940. 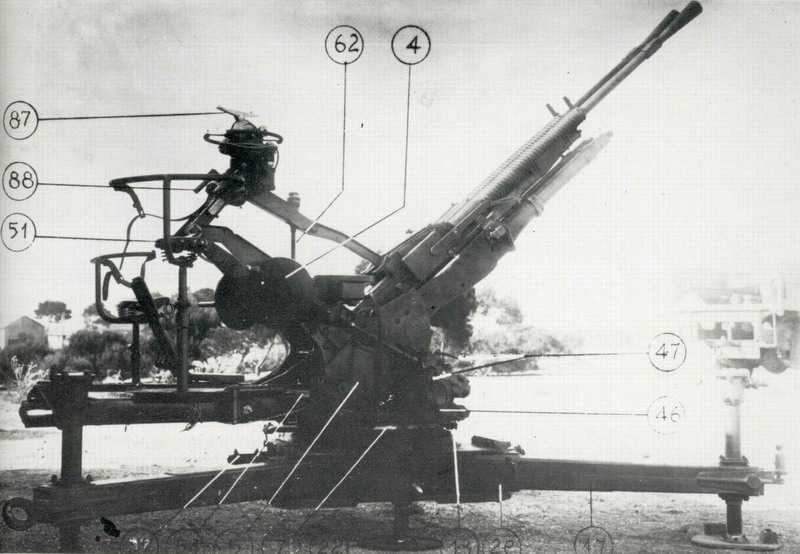 It was found to have some design shortcomings, which were addressed in the CAMle 1939 single-gun ground mount, also in use by the Army in 1940. 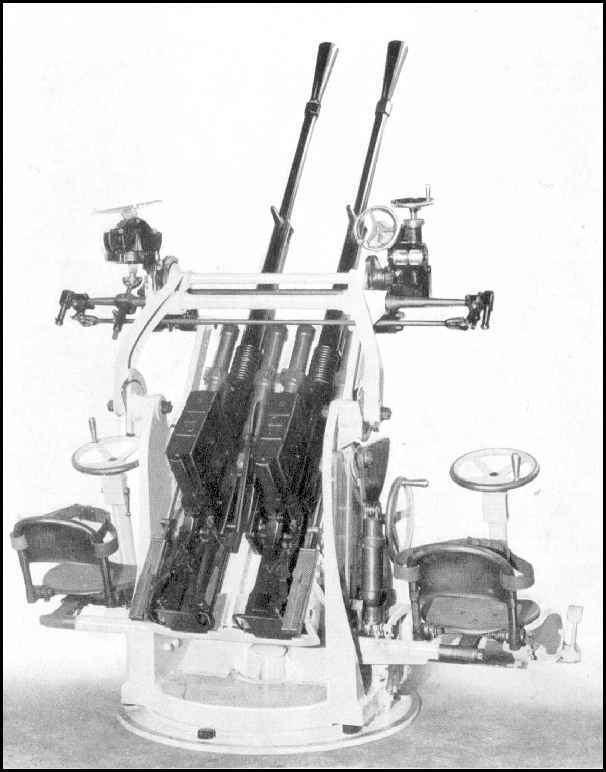 The CAMle 1940J was a twin-gun towed tripod ground mount, a few examples of which were produced in 1940. The French Navy belatedly placed orders with Hotchkiss at the start of the war for the air-cooled Mle 1939 but it is believed that few if any of these actually entered service prior to the Armistice. Following the French surrender, both the Mle 1939 and the improved Mle 1940 reached the fleet in limited numbers. All Hotchkiss 25 mm guns were gas operated and used a 15-round magazine. Data in this table is partially based upon the Japanese 25 mm/60 Type 96. ^Although later models had a higher cylic rate of fire, the practical ROF was limited by the need to change out the 15-round magazines. ^Destroyers had 800 rounds per gun of which 150 rounds (10 magazines) were kept in ready use lockers next to the guns. The Mle 1939 and 1940 mountings had a circular base with cutouts. These cutouts were used by cam followers and limited the elevation and train of the mounting to prevent firing into the ship. This was a fairly complicated assembly and the French later adopted the use of "safety rails" similar to those used by the British and American navies. 25 mm on unidentified French destroyer. 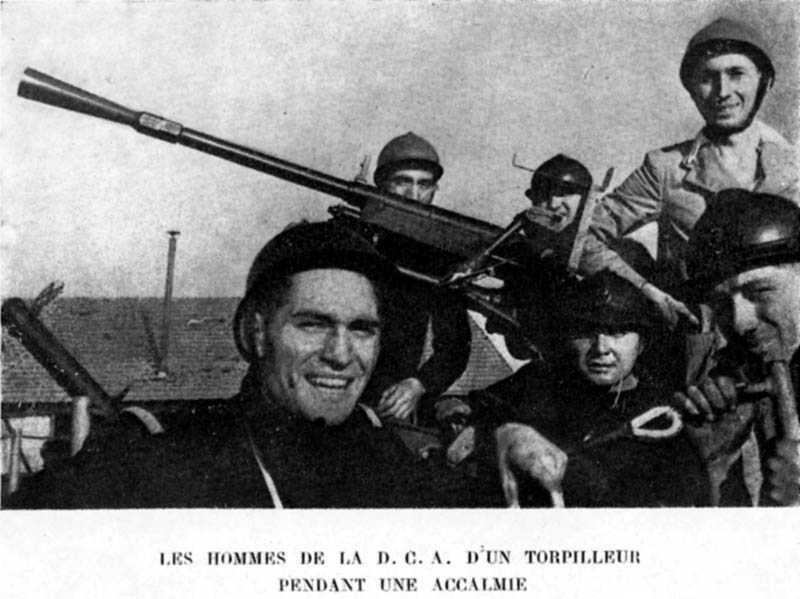 Caption translates as "Crew of an anti-aircraft weapon on a destroyer during a lull". Image courtesy of John Schaefer. Army Twin 25 mm Model 1940J. Image courtesy of John Schaefer.